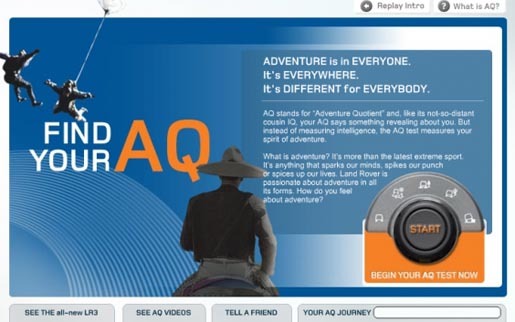 The Landrover AQ campaign was developed at Y&R Brands, Irvine, by executive creative director John Doyle, creative director John Hage, art directors/copywriters Dave Horton and John Fiebke, and agency producer Tricia Hoover. Filming was directed by Jared Hess (director of the cult movie, Napoleon Dynamite) at Moxie Pictures, with director of photography Munn Powell. Editing was done by Geoff Hounsel at Lost Planet. Sound was designed at Elias Arts. 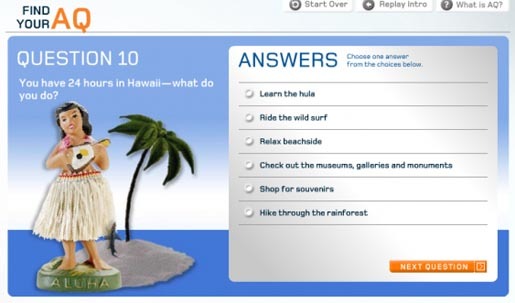 The Adventure Quotient site was developed at Barrett Newton.